When 18 months ago Patrick Anderson decided to come back and play another Paralympics wheelchair basketball tournament, Canada immediately became one of the favourites to win a really tough competition. Anderson, 33, will line up against Great Britain in the semi-finals on Thursday and is considered to be the greatest player in the history of the game, an innovator who has taken the sport to a new level. He was one of the first to bunny-hop in his chair and effectively jump to claim rebounds. "I might have been a game-changer in the sense of belonging to a generation of gamer-changers," he says. But Anderson plays down his role in how the game has improved over the last 15 years, adding: "I came along in the mid-1990s when guys like my team-mate Joey Johnson, Troy Sachs of Australia and Mike Frogley was coaching them at the University of Wisconsin, and they were doing the dynamic things like tilting on one wheel, and I was a teenager and just soaked that in." He has achieved everything possible in the sport, having won both Paralympic and World Championship gold medals, and after Beijing decided that he wanted to do something else. So Anderson retired to follow his dream of becoming a professional musician. He went to university in New York to study and turn his talent for playing the guitar and piano into something more than just a hobby. "There is a big difference between talent and skill, and perhaps I took for granted in sport all those years that it took for me to transform my talent into skill," he continues. "It was a humbling lesson for me to learn, but it is also exciting. In musical terms I feel young. Maybe not as an athlete, but I have a lot of years to work at it." Anderson decided to have one last crack at the Paralympics and in 2011 came out of retirement because he wanted to be part of London 2012. "I decided to come back 18 months ago, but it wasn't a straight line from there to here, there were some ups and downs," he says. "I knew you guys were going to put on a good show. I heard the country was ready to be part of the Paralympics and embrace it; I wanted to be part of that and show them what I and we can do." It appears Anderson is ready to wheel off into the sunset, but the imposing Canadian does have a vision of the future that could mean a radical change for disability sport. "Personally, I would love to see more able-bodied integration," he said. "I grew up in Canada where able-bodied players were fully integrated. There was no distinction really. I benefited from that and I think the sport does. "Further beyond that, the sport in Canada belongs just as much to able-bodied people. There is always this unnatural split - there is a culture of inclusiveness in Canada, but when we went to represent Canada we had to leave some of those guys behind, some of whom deserved to play at that level. "Over the years I have become more unsatisfied with that division. I think it's artificial and I think it's limiting for us as athletes who want to compete and play against the best. "There are some great able-bodied players out there and it's great for the game. I think it's great for our self-confidence to hold our own and maybe even one-upping them." As to why people would play wheelchair basketball over basketball, this is what Anderson says: "Why ski when you can snowboard, or why snowboard when you can ski? They are similar but not the same. "Maybe your dad played it or you saw it on TV and you were inspired and you wanted to try it out?" Anderson remains the most dominant player in the sport and continues to be a game-changer on a nightly basis. If anyone doubted whether he would still be a force in London, those thoughts were quickly banished. 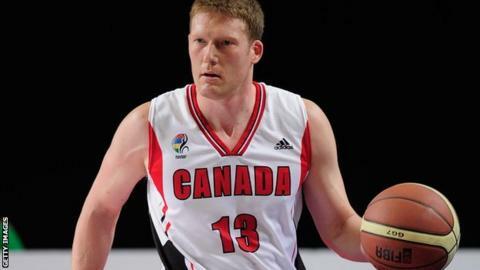 He became the first Canadian Paralympian to score a 'triple-double' of 29 points, 14 rebounds and 10 assists against Great Britain on Friday, and followed up with another of 25 points, 15 rebounds and 12 assists against Germany on Sunday. The history books will show that, like his vision for the future of the sport, his career on court pushed the boundaries so much it changed the game forever.